An MVP, or minimum viable product, is more important to than its “just enough” criteria might let on. 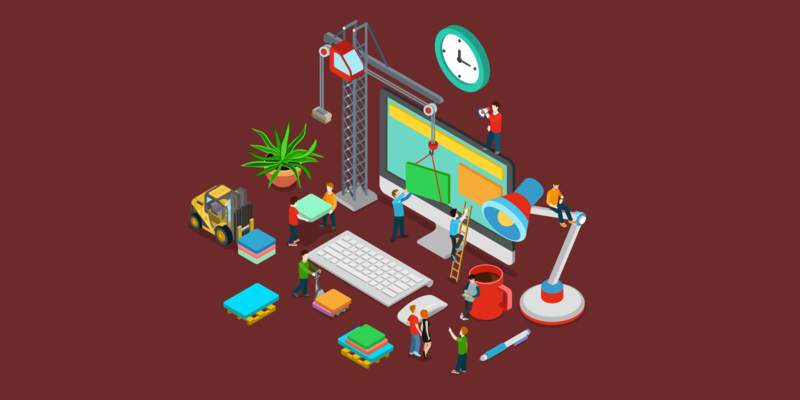 Getting great products to market early on lets them experience and be experienced by your user base, sparking even more ideas, building momentum for your development vision, and growing a community of engaged customers around your company. Alas, it’s easy to stumble on the journey from ‘minimally viable’ to ‘most valuable’ as your team can get lost in the weeds of process instead of keeping productivity in view. After the initial motivating idea is sparked, the work begins: There’s the prototyping and building phases, rounds of feedback and tweaking, and then testing out in the wild. All of these phases are crucial to building the most effective product to hit the market. 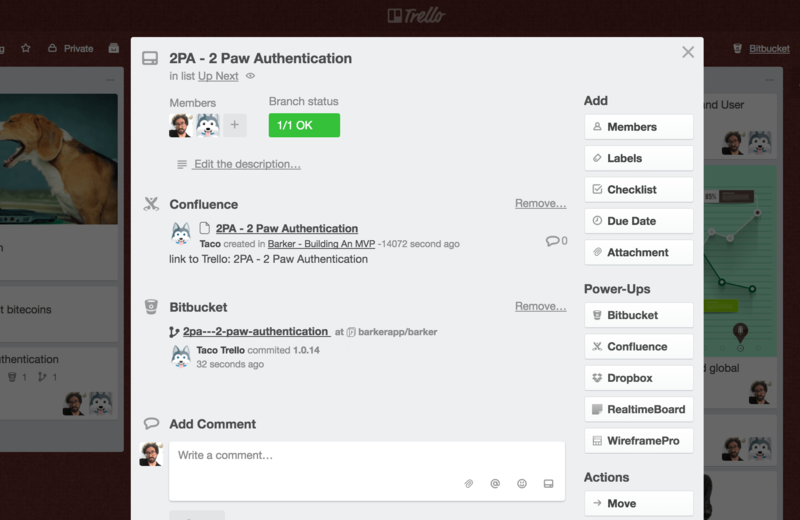 And the best part is, the entire process can run in Trello, meaning you can go with the flow when it’s time to dig in and ship out. 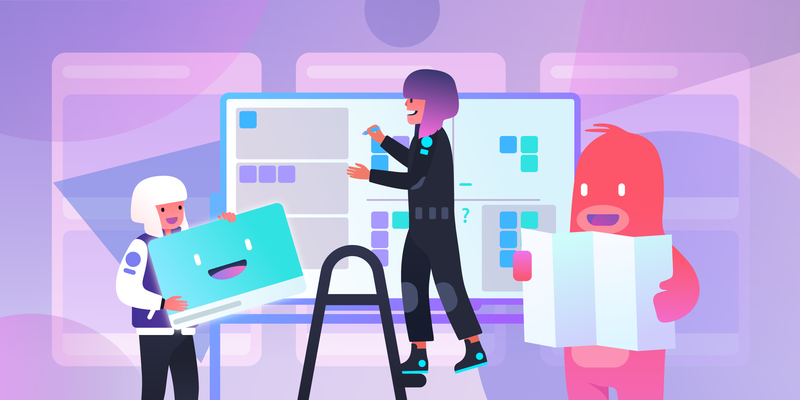 Help your team ship products and features faster than ever by turning your Trello board into a platform for productivity. Let’s take a look at five Power-Ups you can incorporate into your idea-to-product development workflow.  It’s exhilarating when that spark of inspiration strikes and you realize you have a brand new, exciting idea. When ideas are flowing like fine wine, you and your team need a quick place to centrally organize all the brainstorming that is happening. 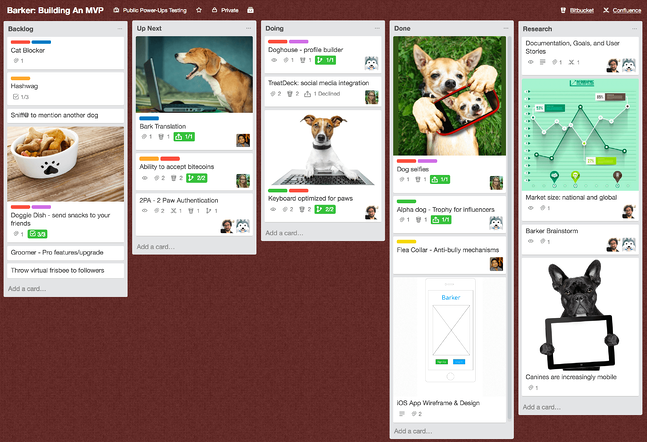 A Trello board is a natural place to jot down and get perspective on your budding creation. As we always say, when creative lightning strikes, a new board begins. For example, given the rise of adorable dog product mascots, it’s easy to assume there is a need for these furry friends to get together and talk shop. Thus, the idea for a new social media platform is born: Barker, a digital networking space for canine mascots to connect. After the initial Trello board is created for Barker, it’s important to figure out a way to capture ideas and inspiration as they come. This is where enabling the RealtimeBoard Power-Up comes in. 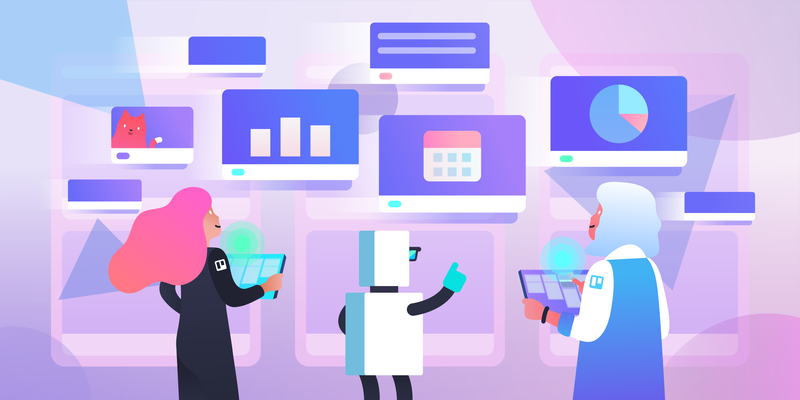 With this feature, we can create and attach RealtimeBoards directly to Trello cards, allowing us to brainstorm ideas, make associations between concepts, and collect free-flowing inspiration on a digital whiteboard in the cloud. Ideas are flowing in left and right, but now we need some direction. With so many great ideas, we need to actually define the goals and scope of this project. After all, we can’t just start building something without a map or a plan. (We probably could, but the results would not be pretty.) Also, it is important to define the features that need to be created to ship our MVP. Should we prioritize 2PA (2 Paw Authentication) or Hashwags (commonly called hashtags on human social media apps)? Should there be optimal bark limits or sniff@ to mention other dogs? 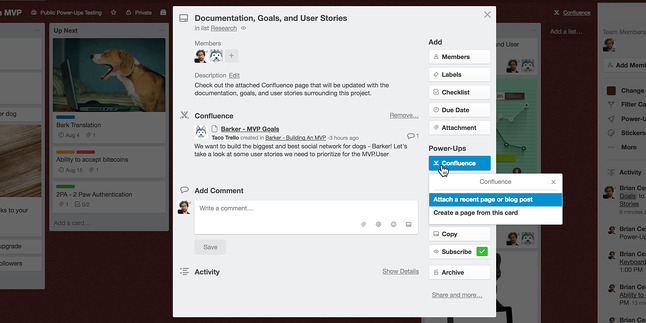 The Confluence Cloud Power-Up brings powerful document collaboration right to a Trello board. From the “Goals and Functionality” card, we can create and attach a Confluence page, once again keeping all of our project’s important information centrally located and exactly where the rest of the team would expect to find it. 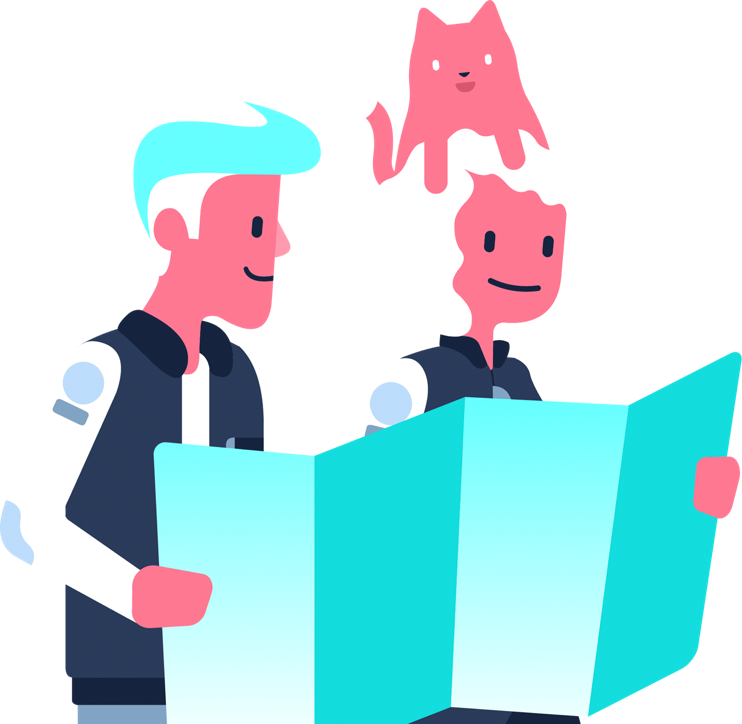 On the Confluence page, we can establish the goals for the Barker MVP, and add user stories to help us prioritize the essential features for our beta. Other board members can easily hop into the page to share their opinions, and the Confluence Cloud Power-Up is handy because it displays when attached pages were last updated, saving unnecessary clicks. Once we determine the core functionalities of Barker, it’s time for wireframes! 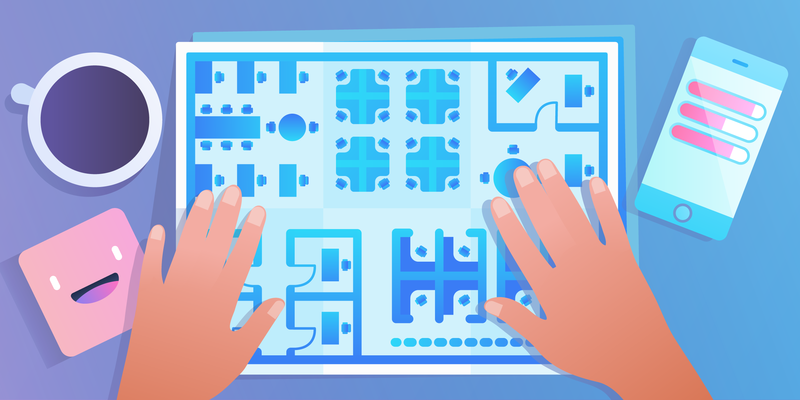 Building even the most basic MVP of an app still requires a large amount of user interface (UI) work, piecing together the visual elements for features, and providing the blueprint for the next steps in the design phase. Building a social media app for dogs provides for all sorts of interesting problems to solve. Wireframes are a key component of design because they are the intermediary step between a sketch in a notebook and a fully detailed design. The black and white nature of a wireframe allows the team to objectively look at the layout, features, and navigation of an app before adding all of the sparkle. 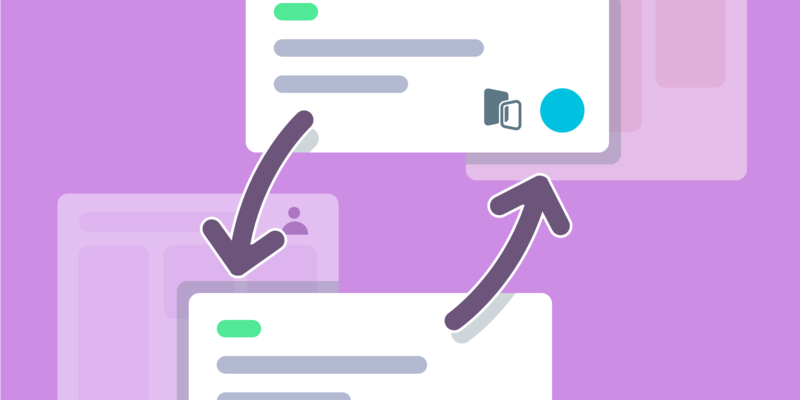 With the WireframePro Power-Up, you can create complex wireframes without leaving your Trello board, and attach them as cards so that the rest of the team can easily access the relevant files and leave feedback in a central location. Attached wireframes can also be displayed as card covers, allowing the rest of your team to see the progress taking place right in front of their eyes. Once the wireframes are finalized, it’s time to unleash the design team to create the mockups. 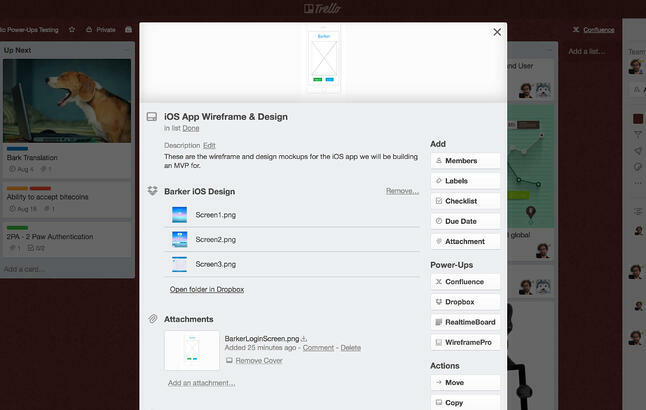 Enabling the Dropbox Power-Up, the team can attach their designs to the corresponding cards. The Dropbox Power-Up allows teammates to seamlessly attach files and folders to cards with thumbnail previews of the attachments. 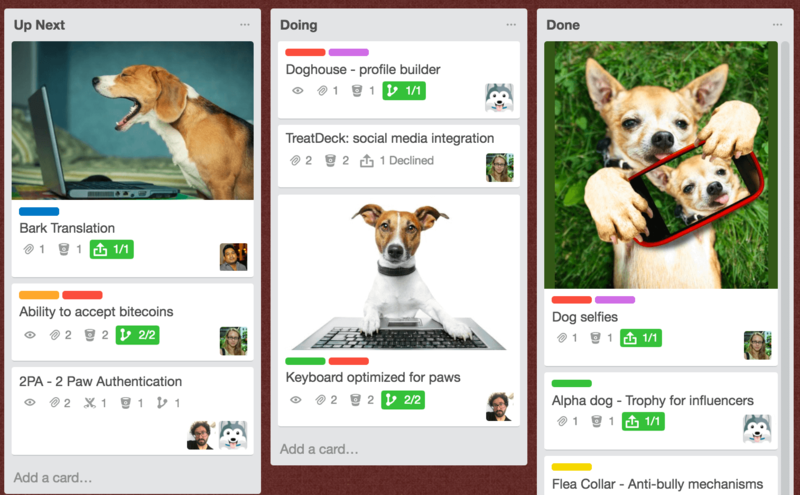 Once again, having everything organized on Trello cards makes it easy to see the progression as ideas become images. 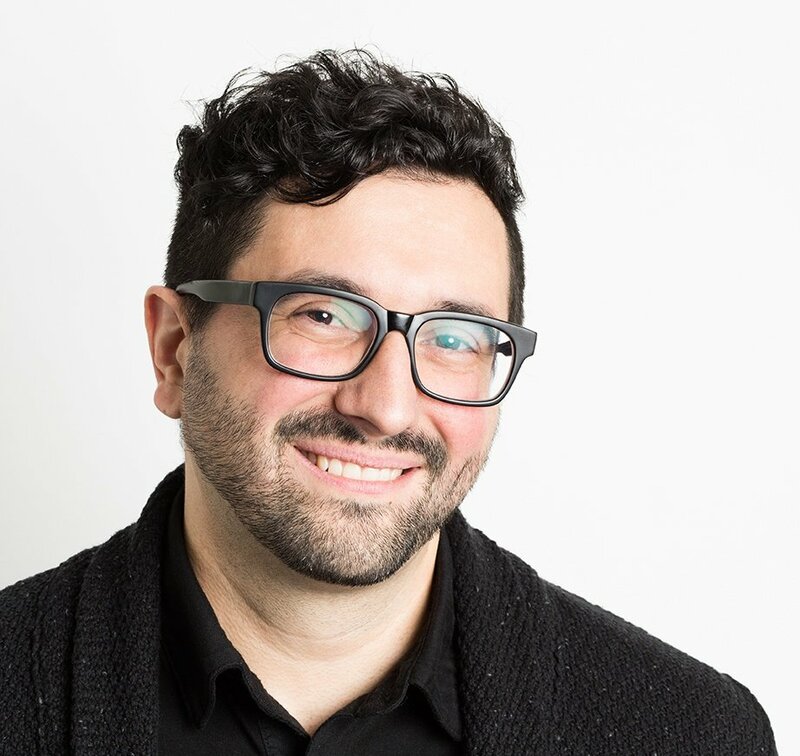 Taco and the team can leave comments about specific changes that need to get made and nothing gets lost in endless email chains or local files residing in isolation on someone’s laptop. The final step in bringing the Barker MVP to market is the development phase. Taco has a team of rockstar-ninja-wizards that, when not on the road playing shows and performing tricks, are also great coders. As cards make their way to the Development list, we enable the Bitbucket Cloud Power-Up allowing the team to attach pull requests, branches, and commits from Bitbucket to the Trello cards they are working on. Developers can easily reference any design specs and then jump into the codebase in a single click to get to work. Plus, less technical team members can track a developer’s progress and see at a glance the work getting done. Badges on cards will display the statuses of attached branches, pull requests, and commits, making it easy to know what builds are passing their checks and what needs to be rolled back and looked into. Open pull requests that are waiting to be merged into a branch will display where the branch is going to be merged, the reviewers of the pull request, if they’ve approved it, and the status of checks all on the card back. When all of the badges are green, it means we are good to go and it’s time to launch! 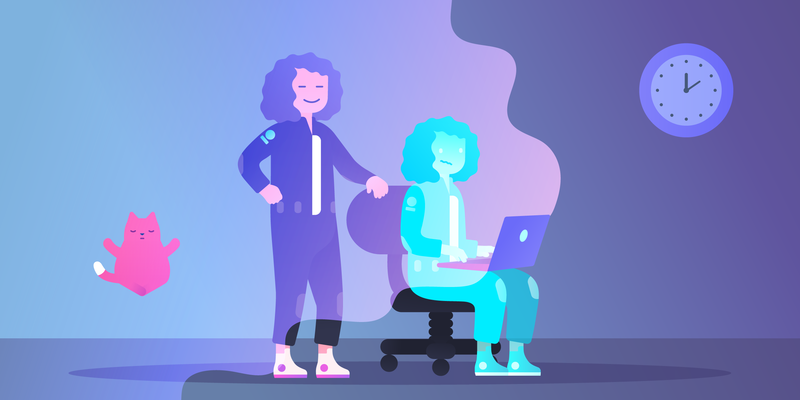 Of course, building an MVP is just the start of a long walk in the park, but incorporating a pack of Power-Ups into your team’s workflow makes for a more organized and productive journey. With the right process in place, your team will feel more motivated to take great ideas to market faster and more often. You can begin unleashing Power-Ups on your boards by enabling them in the board menu. Every board comes with one free Power-Up, and Business Class and Enterprise teams get unlimited Power-Ups.